Airport Pick-Up - How will I find the person meeting me at the airport? Our Rep will know YOUR name and flight details, so you can be sure that you are being met by the correct person. Airports - Which airport should I fly to? Montego Bay - for Accommodation in Silver Sands, Runaway Bay, and Ocho Rios. Kingston - for Accommodation at San San Villas in Portland. Sometimes our guests get much cheaper flights to/from the further airport and wish to be transferred from there. We can arrange transfers to/from either airport, whichever is more convenient for you; but there may be a separate charge for this. Free Airport Transfers, i.e. one Pick Up and one Drop Off, are only provided for Montego Bay for stays of at least seven nights in a single accommodation at Silver Sands. 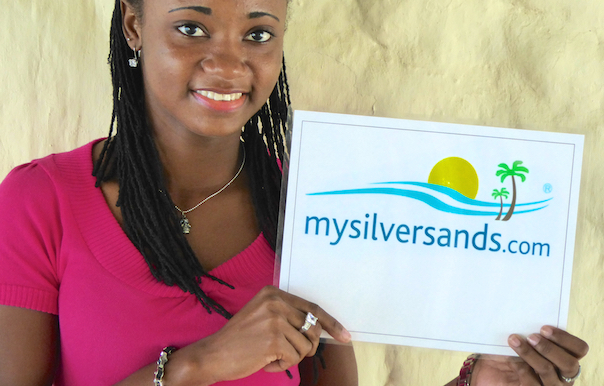 Click here to find out more about Mysilversands Airport Transfers. It's a good idea to check out what to expect and what to do when you arrive at the airport. See our Montego Bay Airport Tips. Arrival and Departure Dates - Do you have set days for departure and arrival? No. You may arrive on any day of the week and leave on any day of the week. There is one exception to the above, and that is Oh Boy Villa in Silver Sands, which does not permit a booking of 8 or 9 nights. Baby-sitting - Is baby-sitting or nanny service available? Mysilversands does not offer baby-sitting or nanny services, nor does it make any recommendation for any parties offering these services. Many guests make arrangements for baby-sitting or nanny service while on vacation. Service providers are available and guests may make their own arrangements for the type of service they require. Mysilversands makes no recommendation and does not endorse or approve of any arrangement that guests may make for childcare. We discourage the practice of the regular villa staff looking after children as they have their regular responsibilities to fulfil. Buying Groceries - Do I have to shop for the groceries? Your villa staff will be happy to do the grocery shopping for you but you may do the shopping if you wish. Some people enjoy the experience of local shopping. Before you arrive, you may send us your grocery list and we will pass it on to the villa cook or the store of your choice. If you do not specify a store, we will choose a local convenient store to provide your initial supply of food and drink. Many of our repeat customers like to stop on the way from the airport at one of the larger supermarkets en route, where there is a greater variety of goods on offer. This grocery "Stop To Shop" may not be possible if your driver has another job scheduled, so be sure to request this before your arrival. There is a fee - US$30. If you are relying on the staff to do the shopping, be sure to tell them of your budget and what you like and do not like. Also, insist on getting itemized receipts for all your purchases, including those made from informal vendors. Upon arrival, please ask for and check your initial grocery bill, and continue to check your bills periodically during your stay. Some guests staying at Silver Sands like to go to the markets in Brown's Town up in the interior hills or at "ben' down" in Falmouth, the largest market in the English-speaking Caribbean, while others dread the thought of crowds and the accompanying hustle and bustle. Find out How To Ensure You Get The Most Out of Your Jamaica Villas Vacation Rental With Staff. Can I have a wedding, party or other celebration at my villa? Small weddings, receptions and other celebrations are possible at some of the villas at Silver Sands. Generally, villas at Silver Sands are NOT party venues and hosting any event at one of these properties will only be permitted if you have booked a stay there AND you obtain permission in writing in advance. Please contact us for more information on which villas are happy to host your event. If you wish to host your event at the Gazebo on the Jetty, the Beach, or any other of the “Common Areas” at Silver Sands, you will be required to obtain permission from the Silver Sands Cottage Owners’ Association (SSCOA), and a fee may be payable to the SSCOA. We will be happy to make the arrangements for you. Find out about Free Weddings in Silver Sands Villas. Car Rental - Do I have to rent a car? No. There is a lot of available private transportation for hire, including ours, which is less expensive and less troublesome than renting a car. In Jamaica, we drive on the left, which may be the "wrong" side of the road for you. Also, like many developing countries, a lot of roads lack adequate signs, making getting lost not a difficult thing to achieve. Roads are often also damaged with potholes which most local drivers will know about. If you intend to go out a lot, it may suit you to rent a car. But if you are only going to do a couple of trips, then hire our bus. We'll get you there safely in air-conditioned comfort. Find out more about using our bus, click Transportation. Warning: If you hire other transportation, please ensure that the operators are properly licensed and insured and that their vehicles are safe. Also, be sure you agree upon a price before you start the journey. Under no circumstances should you leave it to the end of the journey or the end of your stay, no matter how nice the driver appears to be and how many people appear to know him. If you decide to rent a car and drive yourself in Jamaica, you may find providers online and we may also be able to arrange it for you. You should definitely check out our Tips for Driving Oneself in Jamaica. Check-in & check-out times - What are the check-in and check-out times? Early check-in or late check-out? Check-in time is 2:00 PM and check-out time is 10:00 AM. Early arrivals and late check-outs may be permitted if the accommodation is available. A check-in before 9:00 AM or check-out after 5:00 PM may be permitted for an incidental charge of US$50. A check-out after 8:00 PM, if permitted, will incurr an additional night's rent. Cook - Do I have to supervise the cook? As far as being involved with the cooking, it's entirely up to you. Some guests enjoy cooking and spend a lot of time in the kitchen learning to make Jamaican favourites. We have seen others send the cook home early so they can do their thing. But most guests leave it all up to the cook with the minimum of instruction: "Lobster tonight, please." It's a good idea to sit down with the cook and discuss a meal plan which may be as detailed as you would like it to be. Providing a budget for groceries is also strongly recommended. Groceries may be more expensive in Jamaica than in your home country. Damage Deposit - What if I break something? Is a damage deposit required? Guests are responsible for damages, except for fair wear and tear. We do not require a damage deposit because this has never been a problem. The rare instances of damages have been met with understanding from both the accommodation owners and guests. Guests who receive permission to host parties, weddings, etc., at the accommodation are usually required to pay a damage deposit. Please inquire.